The Clark Duplex will take you back to simpler times when life was easy and laid back. Guests who choose the Clark house savor the unparalleled beauty of our beaches and have a direct connection to it. This elegant 2600 SF beachfront residence is beautifully furnished. Its well-stocked kitchen with granite serving bar makes this home the perfect place for family gatherings. 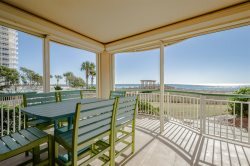 Spacious living area leads to a large Gulf Front balcony with a real porch swing. A private boardwalk leads from the balcony directly to the beach. Master Bedroom is also Gulf Front with a large balcony and private bath. Each guest bedroom has a private bath and there is a half bath on the living room level. Electronics include 36" TV in Living Room and 32" TV in Master Bedroom. We got evacuated for 2 days through Hurricane Michael. We were pretty bummed about leaving the ocean. We rented a motel in Foley, Alabama for 2 nights. The reality refunded our money for the 2 nights lost and added an extra day on our vacation. We were back in our condo on Thursday morning. The staff was so courteous and understanding. Excellent service as we were treated like rotalty. Thank you!! We had the best time and the perfect location and beach house. We will definitely be back and tell all our friends about this Duplex. The duplex looks exactly like the pictures!!!! Thank you so much for everything! We received excellent customer service from Perdido Realty!! Thank you so much for making everything go so smoothly! Overall I loved the place. I enjoyed having the beach to ourselves. Everyone at Perdido Realty were awesome handling anything we needed! They were very reachable after hours, which was really nice as the AC went out on us a few times during our stay due to power outages just before our arrival. Michelle went above an beyond to make sure things were handled well. The Clark Duplex was just as I remembered it from the few times I had stayed with my brother years before. We could not ask for better owners being so nice and understanding to us in 2016 with our Flood situation in Louisiana on the say we were to check in for our vacation at the beach. Only suggestion we had from the guest on the third level was more bath towels (so we went around sharing the quantity of towels, a few more at the house would be nice to add). It is nice to see a beach home being so well maintained! The Clark Duplex was awesome! Thank you for allowing us to stay.